Divide spices evenly among 4 pint jars, then stuff in onions as tightly as possible, leaving 1/2 inch head room in each jar. Heat the vinegar, water, sugar and salt until the sugar and salt are dissolved, then pour over the onions in each jar, leaving 1/2 inch head room at the top of the jars. If processing the jars for long-term storage, wipe the rims of the jars and ensure all air bubbles are removed, then tightly affix the lids and bands and process in a boiling water bath for ten minutes (start timer after water comes to a boil). Check seals after 24 hours. Store jars in a cool, dark place for up to a year. Store any unprocessed jars (or jars that don't seal) in the refrigerator for up to a month. Refrigerator pickles: Pickles of impatience, Pickles of haste. Quickles. I love pickles. Have you ever eaten a freshly made shrimp roll with crispy pickles spiced perfectly to your tastes? Your toes, too, may curl. For quickles, you don’t need any special equipment. Just fill a Mason jar (or an old pickle jar, if you have one) with clean, trimmed vegetables and pour over the brine – a mix of vinegar, water and various spices. Tip: warm up a bit of the water to dissolve the salt and sugar and activate the spices, then mix it with the rest of the cold water and vinegar to cool it back down before pouring it over the vegetables. This way, things stay crispy and bright instead of getting soggy in the brine. Then just put the jar in the fridge for a couple hours to marinate, and it's good for weeks. Not that they'll last that long. 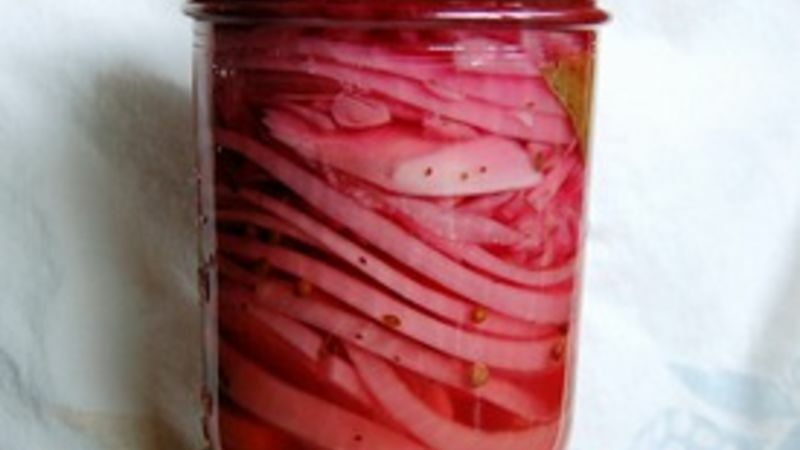 So many vegetables can be pickled in the fridge: cucumbers, onions, carrots and green beans are obvious choices, but you can get crazy and pickle things like baby beets and turnips, or even radishes (try the French breakfast or icicle varieties if you dare). Pick a peck of pickled peppers? Yes, ma'am. How about something really exciting? Try curry-pickled okra. A spicy brine of vinegar and water (at a 1:1 ratio), salt, sugar, hot curry powder, mustard seeds and a few cardamom pods, and you've got a perfect Bloody Mary garnish or beer snack. Don't like okra? Try this brine with cauliflower or unripe green tomatoes instead. Another excellent green tomato pickle (which happens to make a perfect sandwich topper) can be made in a sweet mustard-seed brine, reminiscent of bread-and-butter pickles. Just add a little more sugar (say, a tablespoon per pint), use apple cider vinegar at a higher ratio (2:1 vinegar to water) and spice with a half-teaspoon of mustard seeds, a quarter teaspoon of celery seed and two cloves per pint. There is something about a cheddar cheese sandwich with sweet pickled green tomatoes – you might suddenly want a julep. Want another taste of the South? Make that same sweet green tomato brine, but use watermelon rinds instead of tomatoes. If that sounds strange to you, consider that melons are cucurbits, just like cucumbers and zucchini. Just cut the red part off (eat, cube for a fruit tray, turn it into daiquiris, or whatever you like), then peel off the hard green skin with a vegetable peeler. This will leave you just the crispy white rind. Cut this into spears and put them in a jar, pour the sweet brine over, and refrigerate until they're ice cold and imbued with the wonderful sweet-spicy, briny flavor. Fridge pickles are one of those neat chef tricks that can easily be accomplished at home. In fact, they’re so easy to make that you may consider never buying pickles again - or serving a sandwich or cheese plate without them. Peruse our picks of pickle recipes!